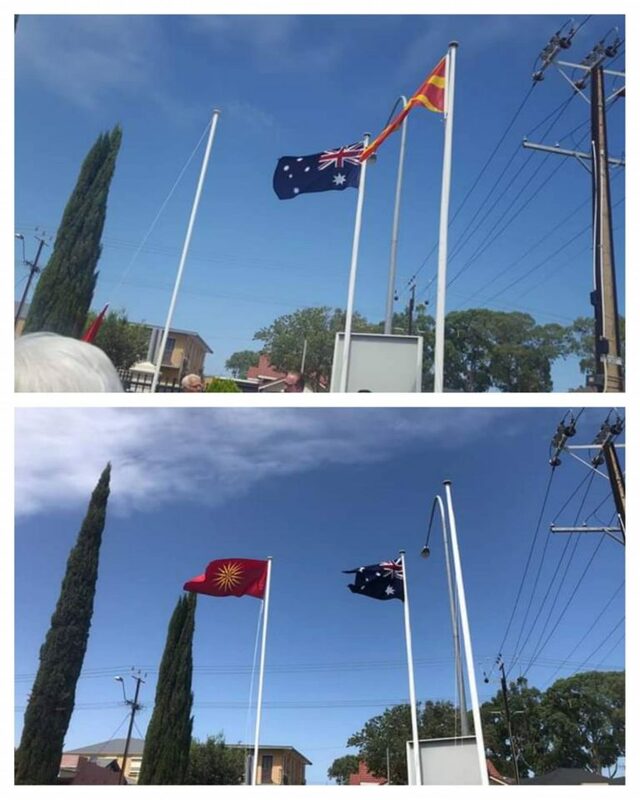 Following the endorsement and approval of the articles of the Prespes Agreement by the majority of the Parliaments of Greece and Skopje, members of the FYROM Communities in Sydney, Canberra, Perth and South Australia, are expressing their displeasure by lowering the official flag of North Macedonia replacing it with that of the Star of Vergina, in an attempt to make their discontent against the agreement known. “Today the Macedonian community of Adelaide and South Australia replaced the imposed flag of the Republic of Macedonia and replaced with the Macedonian flag representing all people of the occupied Macedonian region,” wrote Facebook administrator of a page under the name ‘Macedonian Coalition’. Their actions have left the Greek Communities around Australia confused and disappointed. 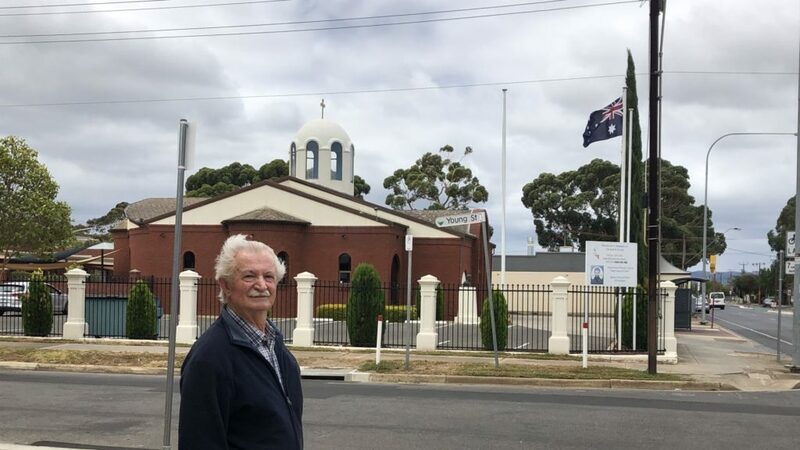 “This is in direct contravention of the Prespes Agreement which was designed to improve relations between the two countries and their communities and it is a slap in the face for all of us Greeks living in Australia,” said Mr Ioannis Mitrousidis, who has been a long-standing member of the Pan Macedonian Federation of SA since the 1950’s and has been instrumental in bringing attention to this sensitive matter. The Prespes agreement involves Greece withdrawing its objections for North Macedonia to join NATO and the EU, and in turn “North Macedonia” has agreed to remove all historic Greek Macedonian symbols (eg, the Star of Vergina) from its territory. The Star of Vergina is considered a protected national symbol of Greece (under the Paris Convention) and despite the fact that the Republic of North Macedonia itself has agreed to remove all irredentist symbols, Mr Mitrousidis, claims that this is not the first time, that the Slavo-Macedonian Community organisations insist on flying the Vergina flag and displaying irredentist maps to provoke the Greek communities, thus disrespecting the Prespes Agreement that their own government has signed, causing distress and upset within the Greek diaspora in South Australia. It is worth noting that in March 2018, the Australian authorities denied a FYROM-Australian organisation that goes by the name World Macedonian Congress – Australia (WMC-A) the right to register the trademark of the ‘Macedonian Sun’ within its logo, sighting it as a national symbol of Greece and that permission needed to be obtained from the Greek Embassy. “Your trademark contains a national symbol of Greece. Under the Paris Convention, Australia must prohibit registration of trademarks containing such symbols. This means your trademark is not registrable without authorisation from the relevant authority,” they wrote. “We have fought long and hard for what historically is ours and we invite everyone to investigate further and conduct their own research so that they can form a more educated view free from external influences and political agendas,” says Mr. Mitrousidis who reveals that for decades, there have been numerous meetings with Government officials in Australia in an attempt to shed light on a such sensitive matter that “shouldn’t still be in dispute”. In the meantime, the Republic of North Macedonia was welcomed into the North Atlantic Alliance/Treaty Organisation (NATO) during a ceremony held for the signing of the NATO treaty/accession protocol on 6 February while the Greek Government has confirmed that the next step in the implementation of the Prespes Agreement is to commence using the name of the Republic of North Macedonia. Neos Kosmos contacted the so called ‘Macedonian Community of South Australia’ but once briefed on the purpose of the call, their representative refused to have any further discussion on the matter.